← Beware! Microsoft stole our software! Books have been written about the many uses for duct tape, but I have never been all that impressed with tape. Sure, I use the stuff, but real ingenuity comes from taking something intended for one purpose and using it for an altogether different challenge. Enter the wire coat hanger. 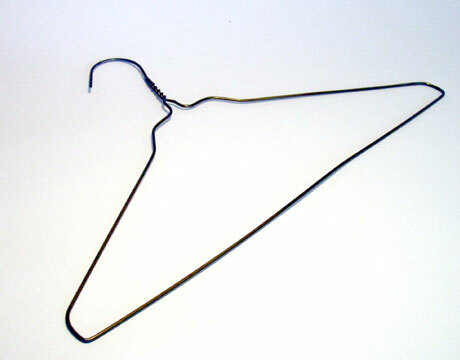 Now used almost exclusively by dry cleaners, since the introduction of the boring, dumbed-down, molded plastic hanger, the wire coat hanger was an invitation for invention. It was a rite of passage for families in the 70’s to bend one of them into a hook for unlocking a car door when the keys got locked inside. My dad, always resourceful, took pride in his wire coat hanger prowess. Sure, there were the simpler uses as a TV antenna or grabber for out-of-reach items, but then there were the works of genius and legend–a tail pipe hanger on a car, a snake for unplugging a drain, tent stakes, and a replacement clutch cable for a Ford Fiesta that lasted for years. I waxed nostalgic just the other day as my two-year-old son watched me unbend a wire coat hanger for our first father/son repair project. Another tradition for another generation. This entry was posted in Off the Wall and tagged Clothes hanger, coat hanger, humor, ingenuity, invention, tradition. Bookmark the permalink. I use it to hold the immersion rod heater onto a bucket of water. We used the wire coat hanger as the initial prototype for the world famous Copy Claw product. We bent it in varied ways, different lengths, etc. until we had a good useable prototype. Back scratcher, that was the hangers real intended use. Who could forget the world famous Copy Claw? Indeed, the wire coat hanger has played a role in many an invention. Al Gore may have used a wire coat hanger when he invented the Internet. Thanks for sharing. Great humor, Lorna. Thanks, again, for reading.